Can Analog Devices Work on a Business VoIP Service? There are a number of analog office devices that can adapt to a hosted VoIP platform. How successfully this is done is largely dependent upon the hosted VoIP provider. The optimum solution is a localized deployment of quality of service programming and an analog adapter, which converts the analog signal to digital for transmission over the internet. There are several examples of analog devices or applications that can be incorporated over a hosted VoIP platform. Fax machines are the most common, but many businesses also need an analog connection for postage machines, security and fire alarms, cordless phones, and other connections to companies who monitor or interface with devices at the business location. Many VoIP providers do not provide this interface for fax machines, preferring that their customers adapt to a fully electronic fax platform. However, some have incorporated the faxing protocol to allow for the utilization of fax machines in the process. Quality of Service a Must – When running voice and data over the same internet connection, many VoIP providers will address call quality by having the customer secure more bandwidth. Not only is this not always necessary, it is not the most effective approach. Whether resident on a router or an edge device, it is recommended that specific QoS programming be in place to prioritize voice packets over data. Where voice quality is very apparent to the end user when it is bad, analog devices simply won’t work well or at all if they don’t receive the highest preference over the internet connection. Conversion Hardware – There are many devices over many manufacturers that can be used for the conversion between analog and data signals. 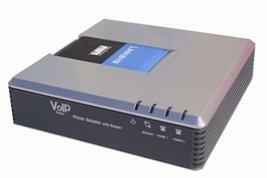 sipVine, a national hosted VoIP provider, has had great success using the Linksys 2102 model when compared to other models. Not only is this adapter very stable, it allows for the adjusting of settings to address particular sensitivities of the analog device or signal. Research the capabilities of your potential VoIP provider when it comes to the various analog requirements of your business. This is definitely a source of differentiation when searching for the best business VoIP provider. You will find plenty that have such capabilities and utilize a variety of adapters, but it will be rare to find one who excels at QoS.